CBMBA is the oldest mountain bike club on the planet! Founded in 1983 as a bunch of riders who wanted to coordinate with each other for rides, races, events, and trail projects, CBMBA has grown is now a full-fledged 501(c)(3) non-profit that maintains over 450+ miles of singletrack around Crested Butte. 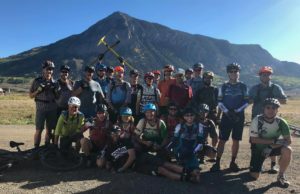 CBMBA works to improve trails, conserve landscapes, and build community through volunteer trail work days, a professional trail and stewardship crew called the Crested Butte Conservation Corps, group rides, and other community events. In addition to our programs in summer, CBMBA grooms and maintains winter trails for fat biking and other uses (as the land managers allow: cross-country skiing, snowshoeing, walking, etc.) that are FREE to the public! CBMBA’s Mission is to build, maintain, and advocate for sustainable trails and to conserve the landscape of Crested Butte and beyond. CBMBA works to balance recreation with conservation, minimizing the environmental impacts of trails when possible. CBMBA believes that recreation engenders authentic connections to the environment and seeks to use recreation as a tool for environmental awareness.